Kaaawa Elementary School students on a field trip yesterday had fun at Kakaako Waterfront Park after visiting Aloha Tower. 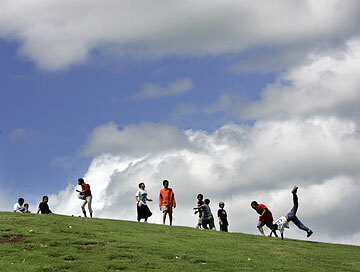 Kaimi Fernandez, 11, doing cartwheels down the hill, was among those enjoying the sun after recent rains that soaked their area. Denver resident Dave Bubb took time off during his business trip here in Honolulu to watch sailboats congregating off Ala Moana Bowls yesterday afternoon. Clear skies have prevailed this week, providing a welcome break from last week's rains and flooding. A surfer cuts back on a wave, the view shrouded through thorny branches of a kiawe tree, yesterday afternoon on the cliff at Diamond Head. Clear skies have prevailed this week, treating Honolulu residents to some sunshine and warmth after last week's rains and flooding. 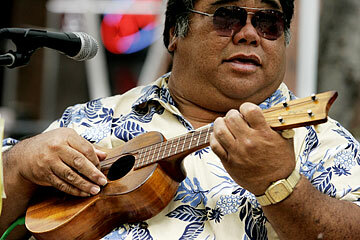 Steve Akana played his ukulele yesterday on Fort Street Mall in downtown Honolulu. Akana is part of a group of musicians who regularly play music together on the mall.